Hyperlactatemia upon admission is a documented risk factor for mortality in critically ill adult patients. However, the predictive significance of a single lactate measurement at admission for mortality in the general population of critically ill children remains uncertain. This study evaluated the predictive value of blood lactate levels at admission and determined the cut-off values for predicting in-hospital mortality in the critically ill pediatric population. We enrolled 1109 critically ill children who were admitted to a pediatric intensive care unit between July 2008 and December 2010. Arterial blood samples were collected in the first 2 hours after admission, and the lactate levels were determined. The Pediatric Risk of Mortality III (PRISM III) scores were calculated during the first 24 hours after admission. Of the 1109 children admitted, 115 (10.4%) died in the hospital. The median (interquartile range) blood lactate level in critically ill children was 3.2 mmol/l (2.2-4.8). Among the children, 859 (77.5%) had a lactate concentration >2.0 mmol/l. The blood lactate level upon admission was significantly associated with mortality (odds ratio [OR] = 1.38; 95% confidence interval [CI], 1.30-1.46; p <0.001), even after adjustment for age, gender, and illness severity assessed by PRISM III (OR = 1.27; p <0.001). Multivariate regression analysis showed that a high blood lactate level (OR = 1.17; 95% CI, 1.07-1.29; p = 0.001), a high PRISM III score (OR = 1.15; 95% CI, 1.11-1.20; p <0.001), and a low serum albumin (OR =0.92; 95% CI, 0.88-0.96; p <0.001) were independent risk factors for mortality in critically ill children. Blood lactate achieved an area under-the-receiver-operating-characteristic curve (AUC) of 0.79 (p <0.001) for predicting mortality that was similar to that of PRISM III (AUC = 0.82; p <0.001). The p-value for a comparison of both AUCs was 0.318. Blood lactate displayed a sensitivity of 61% and a specificity of 86% in predicting mortality at the optimal cut-off value of 5.55 mmol/l, and the positive and negative likelihood ratios were 4.5 and 0.45, respectively. A high blood lactate level at admission is independently associated with and predictive of in-hospital mortality in the general population of critically ill children. Early recognition of children who are at high risk for mortality allows for timely changes in therapy and improves the overall outcomes. Although critical care in pediatric patients has changed dramatically over the last several decades, there has been no consistent marker for obtaining predictions of mortality in a general population of critically ill children. Lactate has been used as a marker of tissue hypoperfusion and cellular hypoxia, and hyperlactatemia is significantly associated with mortality [1–5]. Previous studies evaluated the predictive value for mortality of both a single lactate screening measurement at admission and serial lactate measurements [1, 6]. Hyperlactatemia in adult patients upon admission to a general medical intensive care unit was a predictive marker identifying patients who were at high risk for death . Despite the publication of a few studies that investigated the association of admission hyperlactatemia with mortality in the pediatric population [6, 8–16], information on its importance in a general population of critically ill children is limited [9, 14, 15]. The predictive value of a single lactate level assessed at admission, unlike serial measurements of lactate, is controversial in the general population of critically ill children [9, 14, 15]. One study of 75 patients admitted to the pediatric intensive care unit (PICU) found that blood lactate levels assessed at 24 hours after admission, but not at 6 hours, had better sensitivity or specificity as a predictor of death . Persistent hyperlactatemia 24 hours after PICU admission is associated with mortality, as shown in a study of 50 patients with early hyperlactatemia (lactate >2 mmol/l within 6 hours of admission). In that study group, however, the lactate level measured at admission did not differ significantly between survivors and non-survivors . In contrast to these reports, a recently published clinical study conducted in a retrospective cohort suggested that the blood lactate concentration at PICU admission predicts mortality independent of the pediatric index of mortality (PIM) . The predictive significance for a single lactate measurement as a screening method for children upon admission to the PICU remains uncertain. Furthermore, a lactate level that consistently predicts mortality in the general population of critically ill children has not been identified. We hypothesized that the blood lactate level upon admission to PICU is significantly associated with mortality in critically ill children. This study evaluated the predictive value of admission blood lactate and determined the cut-off values for predicting in-hospital mortality in the general population of critically ill children. All children admitted to the PICU from July 2008 to December 2010 were considered for inclusion in the study. The criteria for PICU admission were adopted from guidelines for developing admission and discharge policies for the pediatric intensive care unit . The study exclusion criteria were death in the first 2 hours after admission and unexpectedly discharged or transferred to another hospital. The Institutional Review Board of the Children’s Hospital of Soochow University approved the study. Informed consent was obtained from the parents of the children enrolled in the study. Clinical and laboratory data were collected on the day of admission and included age, gender, admission diagnosis, illness severity assessed by the Pediatric Risk of Mortality III (PRISM III) score, routine hematological tests, a serum biochemical profile, and arterial blood gas analysis. Clinical status, comorbidities, therapeutic interventions, and medication were recorded daily until hospital discharge or death. The presence of multi-organ dysfunction syndrome (MODS) during hospitalization was determined according to the criteria modified from the international pediatric sepsis consensus conference . The maximum number of dysfunctional organs was 6 (cardiovascular, respiratory, neurologic, hematologic, renal, and hepatic). Children with dysfunction in 3 or more organs were compared to those with fewer than 3 dysfunctional organs. The PRISM III score was calculated to assess the illness severity according to methods described in the original studies [19, 20]. In brief, PRISM III was scored based on age-related physiological parameters collected during the first 24 hours after admission, including systolic blood pressure, heart rate, temperature, pupillary reflexes, mental status, acidosis (pH and total CO2), pCO2, pO2, glucose, potassium, creatinine, blood urea, white blood cell count, platelet count, and prothrombin or partial thromboplastin time. In-hospital mortality was defined as a death occurring in the hospital after PICU admission. A favorable outcome was defined as a child who was discharged to home directly from the PICU or after transfer to another department in our hospital. To determine the blood lactate level at admission, an arterial sample was collected in the first 2 hours after a child’s admission to the PICU. The sample was collected directly into a tube containing anticoagulant. The blood concentration of lactate was measured immediately using an automatic biomedical blood gas analyzer (CCX, NOVA Biomedical, Waltham, MA, USA) as part of a routine panel of blood gas tests in our clinical laboratory with the electrode method, and it was expressed in millimole per liter (mmol/l). The blood gas analyzer was calibrated every 2 hours and checked twice per day. The detection limit for lactate was 0.5 mmol/l. The coefficient of variation was 7.5% at the low level and 5.0% at the high level. The normal range in children is 0.5-2.5 mmol/l. The laboratory investigators were blinded to the sample sources and clinical outcomes. Statistical analyses were done by using SPSS 13.0. Assumptions of normality and homogeneity of variance were first checked. For continuous variables with a skewed distribution, descriptive results were expressed as medians and interquartile ranges. The Mann–Whitney U test was used to determine the differences between two groups, and the Kruskal-Wallis H test was used to analyze the differences among groups. Univariate binary and multivariate logistic regression analyses were performed to investigate whether blood lactate was independently associated with in-hospital mortality. The model fit was assessed with the Hosmer–Lemeshow goodness-of-fit test. A non-significant value for the Hosmer-Lemeshow Chi-square test suggests an absence of biased fit. Analysis of the area under the curve (AUC) of the Receiver Operating Characteristic (ROC) curve was constructed to assess the predictive strength. The nonparametric method of Delong was used to compare significant difference between AUCs (Sigmaplot 10.0 software). Sensitivity, specificity, and positive and negative likelihood ratios and predictive values were calculated at different cut-off values. Optimal cut-off points to maximize both sensitivity and specificity were also determined. All probability values are two-sided. Differences with p values <0.05 were considered to be statistically significant. The study enrolled 1109 critically ill children, including 1045 children with a medical admission diagnosis and 64 with a surgical admission diagnosis. Of the total 1204 children admitted to the PICU during the study period, 54 were first excluded: 37 because of refusal to participate by parents and 17 due to failure to obtain an arterial blood sample during the first 2 hours after admission. Of the 1150 children who had lactate values from arterial blood samples, 41 were excluded: 2 died in the first 2 hours after admission, 3 were transferred to another hospital, and 36 were unexpectedly discharged due to economic reasons. Major medical admission diagnoses included respiratory diseases (39.9%), neurological diseases (24.3%), gastrointestinal diseases (7.3%), cardiovascular diseases (5.1%), sepsis (4.0%), hematologic/oncologic diseases (3.7%), poisoning (2.9%), and others (7.0%). There was no significant difference between the included and excluded children with regard to age (median [interquartile range]: 1.00 [0.25-3.00] vs 0.67 [0.25-3.00] years, p = 0.221), gender (male/female: 689/420 vs 23/18, p = 0.513), or PRISM III score (3 [2-5] vs 3 [0–7], p = 0.740). Of the total 1109 children, 115 (10.4%) died in the hospital. The median time from PICU admission to death was 48 hours (min-max range: [2.5-1176]; interquartile range [24–84]) after admission. Children who were discharged to home were considered to have a favorable outcome. The demographic and clinical characteristics and laboratory findings on the day of admission are compared between survivors and non-survivors in Table 1. The concentration of blood lactate at admission in surviving children was significantly higher than in those who did not survive (p <0.001). Values are median [interquartile range]. Numbers in parentheses denote percentages. MODS, multi-organ dysfunction syndrome; PRISM III, pediatric risk of mortality III. aMODS developed during hospitalization. bAdministration during hospitalization. cThe first available laboratory values during the first 24 hours after admission. Blood lactate was detectable with a range of 0.6-28.3 mmol/l in 1101 samples. For undetectable levels, the values of blood lactate were arbitrarily given values of 0.4. The median blood lactate level measured in the first 2 hours after admission in critically ill children was 3.2 mmol/l. Among the children, 859 (77.5%) had a lactate concentration >2.0 mmol/l, including 485 (43.7%), 204 (18.4%), 79 (7.1%), 34 (3.1%) and 57 (5.1%) who had lactate concentrations of 2.1-4.0, 4.1-6.0, 6.1-8.0, 8.1-10.0 and greater than 10.0 mmol/l, respectively. A comparison of the demographic and clinical characteristics and the laboratory findings collected on the day of admission among children is shown in Table 2. The incidence of mortality in critically ill children was significantly associated with increased blood lactate levels (p <0.001). A significant increase in the PRISM III scores (p <0.001) and the blood glucose concentrations (p <0.001) was associated with increases in the blood lactate levels. In contrast, the blood bicarbonate concentrations (p <0.001) and arterial pH values (p <0.001) were significantly decreased with increases in the blood lactate levels. BUN, blood urea nitrogen; MODS, multi-organ dysfunction syndrome; PRISM III, pediatric risk of mortality III. Univariate binary and multivariate logistic regression analyses were performed to investigate whether the blood lactate level at admission was independently associated with in-hospital mortality (Table 3). Age, gender, illness severity as assessed by the PRISM III score, and laboratory findings collected on the day of admission that were potentially associated with in-hospital mortality were included in the analyses. The following factors were significantly associated with in-hospital mortality in the unadjusted binary logistic regression analysis: gender, PRISM III score, blood lactate level, albumin, glucose, creatinine, urea nitrogen and bicarbonate, and arterial pH value. The odds for in-hospital mortality increased by 38%, for every 1 mmol/l increase in blood lactate (OR = 1.38; 95% CI, 1.30-1.46; p <0.001). The association of blood lactate levels with in-hospital mortality remained significant after adjusting for age, gender, and the severity of illness as assessed by the PRISM III score (OR = 1.27; 95% CI, 1.19-1.35; p <0.001). CI, confidence interval; OR, odds ratio; PRISM III, pediatric risk of mortality III. The p value of the Hosmer-Lemeshow goodness-of-fit test for the multivariate logistic regression model was 0.611.
aThe association of blood lactate with in-hospital mortality remained significant after adjustment for age, gender, and the PRISM III score (OR = 1.27; 95% CI, 1.19-1.35; p <0.001). bThe association of the blood lactate level with in-hospital mortality remained significant after adjustment for serum albumin and the PRISM score (OR = 1.17; 95% CI, 1.09-1.26; p <0.001). cOdds ratio represents the increase in risk per 1 mmom/l increase in lactate concentration. dOdds ratio per 1 g/l increase in albumin level. eOdds ratio per 1-point increase in PRISM III score. fThe first available laboratory values during the first 24 hours after admission. Multivariate logistic regression analysis identified blood lactate (OR = 1.17; 95% CI, 1.07-1.29; p = 0.001), serum albumin (OR per 1 g/l increase = 0.92; 95% CI, 0.88-0.96; p <0.001), and the PRISM III score (OR per 1-point increase = 1.15; 95% CI, 1.11-1.20; p <0.001) as independent factors that were significantly associated with in-hospital mortality in critically ill children. The Hosmer-Lemeshow goodness-of-fit test for the multivariate logistic regression model was not significant (p = 0.611), indicating that the model adequately fits the data. Furthermore, the association between blood lactate levels and in-hospital mortality remained significant after adjusting for the PRISM III score and serum albumin (OR = 1.17; 95% CI, 1.09-1.26; p <0.001). The predictive ability of blood lactate levels from all children admitted to the PICU (n = 1109) for in-hospital mortality (n = 115) was assessed (Table 4). The level of blood lactate was predictive of in-hospital mortality and achieved AUC of 0.79 (95% CI, 0.74-0.84; p <0.001). This AUC is similar to the PRISM III score (AUC = 0.82; 95% CI, 0.78-0.86; p <0.001) for predicting the in-hospital mortality. The p-value for comparison of both AUCs was 0.318. Combining blood lactate levels with the PRISM III score improved the predictive performance (AUC = 0.86; 95% CI 0.83-0.90; p <0.001), which is better than blood lactate alone (p = 0.018), but not significantly better than PRISM alone (p = 0.135). Figure 1 shows the ROC curves and the AUC of the blood lactate level at admission, the PRISM III score, and the combination of the blood lactate with the PRISM III score for predicting the in-hospital mortality of critically ill children. AUC, area under the receiver-operating-characteristic curve; CI, confidence interval; PRISM III, pediatric risk of mortality III. 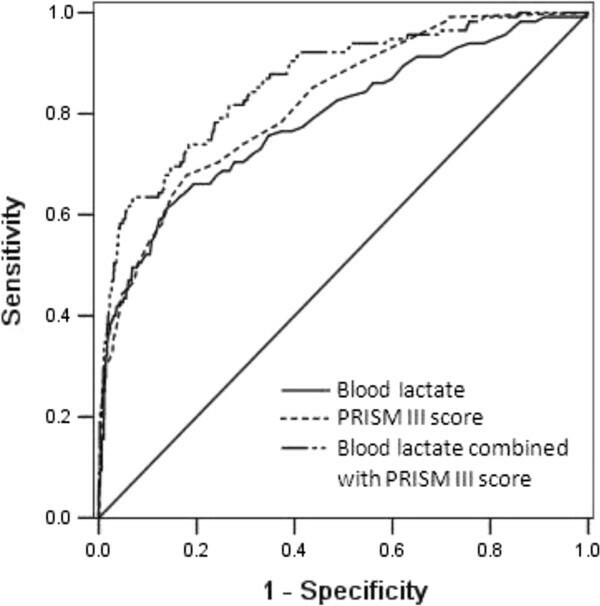 Receiver operating characteristic curves for the ability of blood lactate, PRISM III, and blood lactate combined with PRISM III to predict in-hospital mortality in generally critically ill children (n = 1109). The area under the receiver operating characteristic curve for blood lactate, PRISM III, and blood lactate combined with PRISM III were 0.79, 0.82 and 0.86, respectively, with a Hosmer-Lemeshow goodness-of-fit p value >0.05. The sensitivity and specificity of the blood lactate levels and PRISM III scores at the optimal cut-off value to predict in-hospital mortality are shown in Table 4. Blood lactate displayed a sensitivity of 61% and a specificity of 86% at the optimal cut-off value of 5.55 mmol/l. The positive and negative likelihood ratios were 4.5 and 0.45, respectively. The PRISM III score displayed a sensitivity of 68% and a specificity of 82% for predicting in-hospital mortality at the optimal cut-off score of 7.5, and the positive and negative likelihood ratios were 3.8 and 0.39, respectively. We also calculated the sensitivity and specificity of differing concentrations of blood lactate to predict in-hospital mortality in critically ill children (Table 5). At the cut-off value of >2.0 mmol/l, blood lactate displayed a sensitivity of 94% and a specificity of 24% for predicting in-hospital mortality, and the positive and negative likelihood ratios were 1.2 and 0.25, respectively. The specificity increased to 98%, and the positive likelihood ratio increased to 19.8 at the cut-off value of >10.0 mmol/l, although the sensitivity decreased to 34%. The OR values of blood lactate at the levels above the set cut-off points are shown in Table 5. CI, confidence interval; LR+, likelihood ratio positive; LR-, likelihood ratio negative; OR, odds ratio; PV+, positive predictive value; PV-, negative predictive value. aOdds ratios of blood lactate at the levels above the set cut-off points. In addition, 65.0% children had a lactate concentration >2.5 mmol/l in the study, which is suggested to be an optimal cut-off value for lactate to predict deterioration and mortality in adult patients . Blood lactate displayed a sensitivity of 90% and a specificity of 38% to predict in-hospital mortality at this cut-off value in critically ill children. This study provides data on blood lactate concentrations in critically ill children and demonstrates that the blood lactate level upon admission to a general medical PICU is significantly associated with in-hospital mortality. A high blood lactate level at PICU admission is predictive of in-hospital mortality in critically ill children. Many studies have demonstrated that either admission lactate or peak lactate concentration is associated with mortality in adults [1, 4, 21, 22]. To our knowledge, a limited number of studies verified the use of hyperlactatemia as a prognostic index in critically ill children who are admitted to the PICU [9, 14, 15]. Our results are in line with recently published findings that suggest that blood lactate concentration upon admission to PICU is predictive of mortality, independent of PIM2. Patients with contemporaneous blood lactate and PIM2 measurements at PICU admission were enrolled in a retrospective cohort study . Our study was conducted in a large mixed cohort of critically ill children. Blood samples were prospectively collected for assessing the blood lactate concentration. The observation that the extent of absolute hyperlactatemia is strongly linked with mortality independent of illness severity indicates that blood lactate is a useful early predictor in identifying critically ill children who are at high risk of death in the pediatric intensive care setting. The discrepancy between our data and the data from two studies performed on a small number of patients might most likely be attributed to the small sample size in the previous studies [9, 15]. However, the possibility that the discrepancy might be caused by differences in the course of the clinical illness at PICU admission must be considered. Our study included a higher proportion of patients (859 of 1109, 77%) with a high level of blood lactate at admission (>2 mmol/l), compared to a previous publication in which high values were found in only 50 of the 705 studied children at admission (7%) . Together with the high overall mortality of 10.6% in the present study, this finding implies that children might be admitted later to our PICU, most likely because of delayed PICU transfers. One contribution of this study is the use of PRISM III to control for the severity of the illness. The PRISM III score is a valid measure of illness severity in the first 24 hours after admission and reflects the clinical picture of a child during the early admission period [19, 23]. Previous studies suggest that PRISM III is an important tool in predicting mortality and clinical outcomes in the pediatric population [20, 24, 25]. The association of admission blood lactate with in-hospital mortality in this study was independent of age, gender, and the severity of illness as assessed by the PRISM III score. The ROC curve analysis in the present study showed that the prognostic accuracy of blood lactate for in-hospital mortality (AUC = 0.79) was similar to that of the PRISM III score (AUC = 0.82). Because blood lactate at admission and the PRISM III score obtained within the first 24 hours after PICU admission are comparable in predicting mortality, we recommend assessing mortality risk with blood lactate at admission because it is simple to use. Previous studies suggest that there is a confounding relationship between hyperlactatemia and hyperglycemia in nondiabetic critically ill patients . In the present study, there was a significant increase in the blood glucose concentration with an increase in the blood lactate levels, suggesting that hyperglycemia is significantly correlated with hyperlactatemia. We further demonstrated that hyperlactatemia was associated with an increased mortality risk, regardless of the presence of hyperglycemia. This finding suggests that hyperglycemia did not confound the association between the elevated blood lactate level and mortality in this study. In contrast, although hyperglycemia had a significant univariate association with mortality risk, when adjusted for concurrent hyperlactatemia and/or other potential risk factors, hyperglycemia was not a significant predictor of mortality risk in critically ill children. The accumulation of lactic acid in the blood is generally associated with metabolic acidosis [12, 27]. This finding raises the question of whether it is possible that the association of hyperlactatemia with mortality could be at least partially attributed to the occurrence of metabolic acidemia. We demonstrated that hyperlactatemia is significantly associated with in-hospital mortality in critically ill children, even after adjusting for arterial pH and blood bicarbonate. This study was designed to determine the optimal relationship between the sensitivity and specificity of blood lactate assessment in predicting mortality and to set appropriate cut-off values for predicting in-hospital mortality. A systematic review conducted on studies of adult patients suggests that all patients with a lactate at admission above 2.5 mmol/l should be closely monitored for signs of deterioration . In our study, 65.0% of the children had a lactate concentration >2.5 mmol/l. Blood lactate displayed a sensitivity of 90% and a specificity of 38% in predicting in-hospital mortality at 2.5 mmol/l. Specificity is one of the main characteristics of a predictive marker. A test with high sensitivity and low specificity carries the risk of many false positives. In the present study, an optimal cut-off for predicting in-hospital mortality in critically ill children appears to be a blood lactate level of 5.55 mmol/l, which has a sensitivity of 61% and a specificity of 86%. Our findings were similar to the results of a previous study conducted in children who were admitted to the PICU with a diagnosis of septic shock, where a lactate value of more than 5 mmol/l was an accurate predictor of death . Our data, together with previous data, suggest that all critically ill children with high blood lactate at admission should be closely monitored for signs of clinical deterioration and children with low lactate levels should be considered for further monitoring of blood lactate, since serial lactate values may provide better prognostic information [1, 6, 9, 29]. The limitations of the present study include a temporal mismatch in evaluating mortality indicators. We compared the prognostic performance of a lactate value obtained within 2 hours of admission to a PRISM III score, which considers a range of values and includes the worst values obtained in the first 24 hours of admission. The prognostic accuracy of the combination of blood lactate level and PRISM III score was not significantly better than the use of PRISM III alone (p = 0.135), which might be explained by the discrepancy in the timescales for these two methods. Notably, the primary aim of the study was to evaluate the predictive value of blood lactate, when measured as a screening method at admission, to predict mortality in critically ill children. The blood samples for lactate measurements were collected only within the first 2 hours of admission. Thus, serial changes in the lactate levels during the first 24 hours of admission were not evaluated. Trends in lactate concentration over time reflect the clinical response of patients to resuscitation. Serial measurements of lactate levels might improve the sensitivity and specificity of this prognostic test . Further studies are needed to investigate the trends in the changes of lactate values and explore whether the addition of the highest lactate value in the first 24 hours to the PRISM III evaluation improves the prediction of mortality in the critically ill pediatric population. A second limitation of this study is that the criteria for PICU admission vary widely. Our results might be biased by the fact that we conducted a single-center study. In our study, 77% of the children had an admission lactate level above 2 mmol/l, and 10.6% of the children died during the hospital stay. However, only 32% of children with an admission lactate level between 6 and 10 mmol/l had been mechanically ventilated. Our data imply that children might be admitted later to the PICU and received less aggressive treatment in our unit. These factors may limit the generalizability of our results to health care systems in which children are admitted earlier in their critical illness course and are managed more aggressively. A multicenter study is necessary to confirm our findings. A third limitation of the study is that during the blood collection period, a substantial number of children received treatment with common PICU therapeutic interventions such as epinephrine. Epinephrine is known to affect lactate levels [30, 31]. Unfortunately, we were unable to include these data in our multivariate analyses because we did not have information concerning therapeutic interventions for all children during their transfers to the PICU. Our study indicates that the blood lactate levels on admission to the PICU were significantly associated with mortality in critically ill children, even after adjusting for age, gender, and illness severity. A high level of blood lactate upon admission was independently predictive of in-hospital mortality in the pediatric population. These findings extend the knowledge of blood lactate as a clinical biomarker of mortality in critical illness. Zhenjiang Bai, Xueping Zhu contributed equally to this work. Zhenjiang Bai and Xueping Zhu share first authorship. ZJ Bai participated in study design and protocol development. XP Zhu carried out the data analysis and interpretation of data. MX Li and J Pan participated in clinical data collection. J Hua, Y Li, and J Wang participated in the design of the study and coordination. YH Li participated in data analysis, interpretation of data and writing of the manuscript. All authors read and approved the final manuscript.